When I was about 19, I wrote several short stories featuring a woman who had one green eye and one blue eye. She tended to be a kind of catalyzing or challenging role for the protagonist (who was usually a thinly veiled symbol of my fragmentary sense of self). This woman had a kind of haunting presence in my psyche, a strangeness and familiarity I never questioned. It just made sense that she would be there. Later, in my mid-20s, I began doing Family of Origin therapy, and this entailed pumping family members for their stories. My father grew up in a household filled with addiction, violence, emotional abuse, and fear. A central person who helped him survive was his great aunt. she was a fierce spirit, impervious to the intimidation of rural Australian misogyny. A midwife, she garnered a particular kind of status at that time. She was a mistress, or at least facilitator, of the mysteries of life and death. My father always says that she "knew how to set you on the right path," and by that I think he means that she could make a person believe in their true spirit, that she could see past all the internalized slander, gas lighting, and doubt that comes with severe interpersonal trauma. When he talks about her, even now in his 70s, a lightness comes over him (whereas if you mention his father, even now, a shadow descends). This person, the midwife with the iron will, the stern healer, had one blue eye and one green eye. In recent years she occasionally has visited me, clothing herself in the dress of my imagination. She doesn't give me advice. She offers a silent fellowship that tells me to keep trusting in my own idiosyncratic path. I've never told my father about her. The funny thing is, he read the stories in which she appeared as a character. He must have known that I had no idea about the real life ancestor with the blue and green eyes; she was dead before I was born. Enigmatic soul that he is, he never commented on the strange co-incidence of it all. To me, that very silence indicates his intuitive grasp of the situation. My father is a strict rationalist, and at the same time he has one toe dipped into the pool of mystery. In this way she, he, and I are connected by a silver cord that spans the cold void of time. While working to stop making bad choices in relationships and to heal myself, I researched and discovered hidden family stories. My extended family is part of a Chinese American culture of silence and I found the bases of my information from reading my grandmother’s Angel Island Immigrations Station Foundation interrogation transcripts. This research and discussion, opened my mother up and she began to share some of the background of her life. Unravelling them, has brought me to a place of healing and wanting to help others grapple with their negative life patterns. I share them to heal my past, for family and community and to provoke a collective dialog to wake up our souls to the devastating trauma of human trafficking. I work to grow curiosity and raise consciousness about who we are individually and how we interact with the world. I’ve used the stories that have been gathered over the last 25 years, as components for art installations that have reached people’s hearts and inspired them to think about their lives and choices differently. I am grateful for the gift of art as expression. Understanding creates Acceptance, creates Compassion, rooting Love. My U.S. born grandfather, Mock Wah Him, purchased my maternal grandmother, Hom Shee Mock, in China 1923. She was his family’s servant as a second wife. There was no passenger ticket for Hom Shee Mock on the SS Lincoln. Traveling from China to San Francisco, she traveled in the cargo hold. She finally arrived in San Francisco after being interned and interrogated for 3 months, threatened with deportation at Angel Island Immigration. My grandfather died shortly after the 7th child was born, leaving her and her children penniless in San Francisco Chinatown. My mother, Mock Soo Lon (Hom Shee Mock's daughter), was the eldest daughter of seven. At age 6 her father began trading her for his opium. She was sexually abused by Mr. Sing (the opium dealer) until her father died of tuberculosis when she was about age 12. She was sent to a tuberculosis sanitarium on and off most of her early teens. (She shared this information so I could include in my art installations about her mother and siblings.) She went on to lead a relatively calm artistic life with my father, RICHARD TOM, raising myself and my 2 brothers. Sue is a devout found object artist. At age 90, she has courageously chosen to share her stories with us. She believes that a story shared is a hardship overcome. In 1923 in China, my father Tom Sai Mun (Richard) was sold to a Chinese American couple at the age of 1. They planned on selling him back in the U.S. The Methodist Church in Oakland Chinatown shamed these “parents” into keeping him. They beat Richard cruelly and locked him out of their house often. He ran away when he was 15. Being Chinese he couldn’t go far and luckily joined the California Conservation Corp. Disowned by this wealthy family, Richard went on to create a peaceful life with Sue Tom and our family of 5. Throughout his life he never felt legitimate in the U.S. because of his "paper son" status. He lived in fear of being arrested and deported to China, a completely foreign place. He embraced his lifelong passion as a pottery artist. We never learned of his heritage. Creativity is strength and wisdom. Cynthia Tom is a working artist and a 3rd generation Cantonese native of San Francisco. Her work, sometimes referred to as Cultural Surrealism, is feminist in scope, intense in color and often fanciful in execution. She is the board president of AAWAA, Asian American Women Artists Association, a member of the International Museum of Women & the National Women’s Caucus for the Arts and founder of an arts based healing project, A PLACE OF HER OWN. Visit www.cynthiatom.com & www.aawaa.net for details. There is a story that was told to me many times by my mother while I was growing up about my paternal grandfather, Felix. The story has been told so many times I do not know when I first heard it. My mother spent some years living in foster homes, but a great majority of her childhood was spent in a catholic orphanage. She was returned to her parents home while she was a teenager. When she was 19, she met my father and quickly felt a bond with my grandfather Felix and his wife. My mother married my father within three months of meeting so that he could avoid being drafted for the Vietnam war. My mother was very fond of my grandfather (her father-in-law) and he always has had a legacy in our family. Felix grew up in Vienna, Austria and at the age of 13 he started studying Graphology, also known as handwriting analysis. I have several memories of my grandfather reading people's handwriting samples and providing them analysis of aspects of their personality. In 1938 when the Anschluss (the "annexation" of Austria by Nazi Germany), occurred, Felix was married and living in Vienna. Shortly thereafter, he was designated as Volljude ("full Jewish" by Nazi terminology) because he had at least three grandparents who had been enrolled with a Jewish congregation. His wife was successful at fleeing from Austria to London, but Felix was not as fortunate. He spent roughly six months in both Dachau and Buchenwald concentration camps. This was in an era before Nazis were immediately executing Jews upon arrival at camps, but were harshly forcing them to work excessively as, starving them and treating them as slaves. When I was older, my mother told me that Felix told her he remembers men lined up and so starved and overworked that they would just drop. While in these camps, one way Felix bonded with others in the camps was by analyzing their handwriting and tracking how their handwriting changed over time. One the guards took interest in Felix's handwriting analysis and asked him to analyze his handwriting. Felix did so, and the guard asked what he would like in return for doing the handwriting analysis. Felix asked for a cheese sandwich. The next day while lined up, the guard extended his bayonet with a paper bag hung from the end. Guards were not allowed to be closer than a bayonet's length away from prisoners. In the bag was the cheese sandwich. A cheese sandwich was a literally a lifesaving item to receive. Felix was starving. However, Felix took the bag back to his sleeping quarters. He cut the sandwich into 14 pieces and shared it with his other prisoners. Felix later was granted exit from the concentration camp because he was sponsored for employment in London. He spent a year in London and then was granted access to the United States and later became a professional graphologist. I often wonder how I ended up in social work. I think this story has been really influential in what I always hope to aspire to. I hope, in my most challenging, desperate times, that I will have the hope, the love in my heart, and the strength to share my cheese sandwich. My father comes from a very small town in Turkey. I think his family were also local people in a small town, but that their life views and horizons were not so bright and open as his. He was always a leader in groups and he is known for always making jokes. My dad has a personality of altruism, the kind of person who does everything for his kids. He has a wonderful spirit and he even used to care for street animals! When I was a child, he was my sunshine. I am coming from a Muslim world. Sometimes there, fathers don't send girls to school. My dad used to supply my books, and he always gave value to foreign languages. He used to find sources for me to learn my lessons better. Then, he continued to support my life in studying abroad. He used to encourage me with his life ideologies like “If you feel yourself as a foreigner, how do you expect locals see you as not a foreigner?” Today, after 25 years of long commitment, I have one Bachelor of Science, two Masters of Science, one PhD, and one MBA. I have been studying in 6 different countries and have been in more than 30 countries in the world during this hard journey. He is still my best supporter in life, and today he is my business partner in Paris. When I heard about the Muslim Ban in USA, I applied for a tourist visa and I decided to spend my summer holiday there this year. One of my dreams is to see Broadway in New York City. Despite these obstacles, I decided to go for my dream. Basically, negative events influence me into positive directions and I am mostly inspired and fed by them. I never get demotivated about the obstacles and mostly such things end up triggering me into it. I guess it's a kind of a "negative effect." I dislike borders and rules. But I also try have empathy with the regulations and I don't take anything personally. I cannot avoid a beautiful country like the USA, mostly when I know amazing people there. Why shall I be influenced by such political issues? My parents met in Vietnam during the war. My mother is mostly Vietnamese and my father is American of mostly German heritage. His grandparents were immigrants. I thought my mother’s grandmother or great grandmother was French, but the effort to tell a story here proved me wrong. I was mulling over so many stories, and wanted to talk to them first. “No! Half,” my mother corrected, “My mother’s mother was half French. Her father was French,” making short work of something I've said for decades. My parents’ cross cultural marriage was rebellious. In 1960’s Saigon, my grandmother was a restauranteur and my grandfather was a businessman. My mother went to Catholic school and practiced Buddhism at home. She broke a betrothal to marry my father – a Wisconsin Synod Lutheran country-boy from Ohio and Mississippi. The idea of my great grandmother being a French woman marrying a Vietnamese man was a provocative layer of rebelliousness I had mis-hearingly embellished my family history with. Such mistakes are common in my family. A fairly large amount of personal history didn’t strike my parents as worthy of in-depth conversation when we were kids. I can't believe the hundreds of times I’ve said Cambodia in 30 years. But, that’s not as embarrassing as this: At near the age of 40, I met up with my parents in Saigon while they were on vacation. We took a week and a half tour with three dozen local Vietnamese tourists. It’s embarrassing enough that I don’t speak Vietnamese. The first half of my parent’s marriage, my mother worked hard to Americanize herself, and I missed out. I tried my damnedest during this tour to be gracious to our fellow tour-goers with my minimal and horrendous Vietnamese. In English, I quipped to a lovely Vietnamese woman who spoke some English, “My mother’s name is almost the same as yours!- Lan Phuong!” The woman’s name was Phuong Lan, and she looked at me perplexed. “That’s not right,” she finally said, “The name is Phuong Lan.” My mother had told my three sisters and me her name was Lan Phuong since we were all born. I sheepishly excused myself to unload my chagrin on my parents. “I am nearly 40 years old, mom! Why would you not straighten that out for me? !” I felt kind of devastated. My parents’ given names are Phuong and Sigfred, but they’ve gone by Nancy and Bill since we children showed up. Nancy and Bill. Our family history is riddled with untidy and sometimes inexplicable details. And attempts to make things easier. She did tell us stories, though. Too many to choose from here. And on the period where their paths began to merge, my dad could sometimes correct her, on for instance, the names of old streets in Saigon. He still can. They’ve been married five and a half decades now, somehow both sacrificing and honing their profoundly culturally disparate identities through this complex knot they’ve tied together. I know it wasn’t easy. But, they kept it going. And I have so many more details to suss out. Besides the here and now of our sociopolitical environment, it has been a while since I have spent any time really looking back at because I am so used to looking forward. My Dad’s family name, Assasnik, means “good foundation.” It’s an old and respectable Persian name dating back about 700 years. People with this name have a reputation for being influential and helpful. My Dad’s Mom, (my Grandmother) was ethnically Turkish and Kurdish, and she and my Iranian Grandfather defied convention and married outside of their cultures. 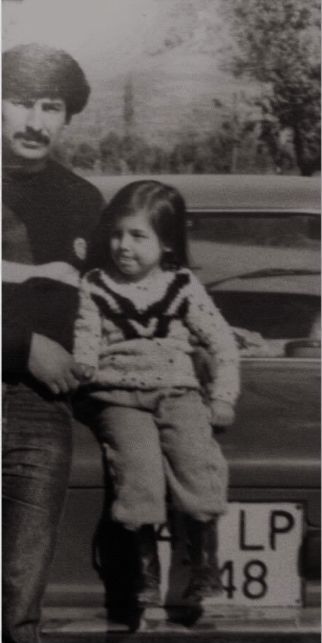 My Dad was born in Iran and he came to the US as a young adult as a refugee just one year after the “disposal” of the Shah. His family bought him a ticket to enter the country as a university student, but in reality he was fleeing his home. Once he immigrated he went through some hard times and was mistreated. My mom’s family is of mixed European descent, and my great grandparents moved to Utah from the East coast to become farmers. They were hard-working, poor, working class, blue collar Mormons and who worked their land. My Grandfather also helped build the railroads and made beautiful jewelry. My Mom was the first person in her family to go to college, which was a really big deal for the family. Growing up I was unsure of my identity. For me and my sister it was like Are we American? Are we Middle Eastern? White? Muslim? There’s so much intersectionality there, and yet here was also a big piece of my culture missing when I was growing up. We tried many times for my Iranian family to come to the US, but because of the huge and scrutinizing process it takes just to even visit the US from Iran, it’s just not possible. And now I have to experience national policy decisions I thought I would never see in my own lifetime and many of the changes directly affect my family. The ban on Muslims, the extreme vetting of people from certain countries, environmental policies, and the possible revocation of the ACA are all things that I and the people in my family are impacted by. Even now my Iraqi Brother-in-law does not wish to leave his country because he’s concerned about getting back home. Despite this, I really do feel that my family’s story is strong and stable. The positive part is of my family is that everyone represented are supportive towards each other and truly care about each other’s well being. We all have survived many of the same challenges and helped each other survive some of our individual ones. This is what makes what my family so strong. When I say “survive” I mean it in the truest sense: extreme trauma, abuse, drug use, mental health disorders, and ultimately death. My step-brother, my father, both my grandfathers are all deceased. I never got to see my own father, although he did see an ultrasound of me and he was able to pat my mother’s belly that enclosed me for nine months. My father left a young wife trying to raise two children on her own. Death, which has played a major role in my life, is the one issue I struggle with the most because it’s such a lonely place. The irony is I consider myself lucky to have such a wonderful and caring mother, and I see that the influence of my maternal side has dominated my life. If it was not for her always putting her children’s welfare first, I would have ended up either like my father or in prison. Where I am challenged the most is facing the idea that these intense experiences happened throughout all of the generations and I am not sure if the cycle is completely broken now. What did those challenges mean for me? What helped us get through it? What things exacerbated already existing problems? These are things for me to reflect upon. I am hoping that if I have children that they will have a lot of support not only from their maternal side of the family, but paternal side as well. Before I went north for her funeral, I had never seen a photo predating my Grandma Inang’s flight across the globe, her first, to live with us. The 5x8 lived in an encyclopedic, cellophane, floral album, one of several mom put together more than 20 years ago. There were pictures of my brothers and I seemingly always smiling under mop-top dos and pictures marked by the same blemishes: dull beige, brown and tan hues and blotches of sunlight poorly rendered by cameras now called vintage. Grandma Inang is stood before a helicopter: smiling with teeth, stood atop a platform of steps and half-turned to wave. She looks set to vacate her residence in preparation for the incoming heiress. Just out of image, I imagine cousins and neighbors sobbing and frowning for our matriarch. She was nearing what for so many remains an envy-engendering myth: America the beautiful ad. I grew up developing an ear for the shouting across the house; joyful, shouted conversation was every bit a marker of where I come from as much as adobo grease and rice or a surname. My piece in the rite was to scratch off a block of ink on the flipside of a five-dollar phone card and dial for Cauayan, Isabela, the second half of which was the inspiration for my mom’s name. When someone greeted me on the other line, I nodded to Grandma Inang and handed the phone to her. I conducted the whole thing in silence as if to hide my presence and motives. Probably a video game. The phone cycled through everyone back home until the minutes expired. Grandma Inang’s shouting communicated a smile, often boiling over into tears, something I never quite understood, or cared to understand. Her every shout seemed to declare can you believe this? Family back home amounted to strangers, though I still was drawn into what felt like obligatory teambuilding exercises. I began to excel in faking my way through sham intimacies, but even through my passive resistance, I could still hear envy in Uncle Lito’s, Uncle Boy’s, Knock-Knock’s, Tweet-Tweet’s, Miyet’s, Marigold’s, Acer’s and Erik’s shouting. Did I know I was one of the lucky ones? Blessed? If not, they made sure I knew. Even if public school more often felt like an exercise in experimenting with forms of alienation, talking to everyone back home still left me with the impression that to be American, to live in the land of opportunity, was akin to an aura or a superpower. An identity, or maybe a responsibility. So strange I think it would be if they knew how I lived my day-to-day life, how to be American feels wrapped up in isolation, yet somehow, preoccupation. I can never know struggle as my family back home knew it or as my mom and Grandma Inang did. My experience as a first-generation kid is the stuff of imagination, of being one degree removed, which is not to say that any claims to history are baseless, merely that part of my makeup emerges from the need to translate (a fading) transition—to find out what it means to come from where I come from. The moments are more often than I care to admit where I feel no concrete link to being back home, and my image is rendered tenuous and embarrassingly foreign: nothing more than caribou and fields of rice. Nothing any more substantive than the next Yank who spent a week at one of our prized archipelagos boasting sand whiter than, well. I worry about the place I have only ever seen once and about deceiving myself into a history to which perhaps I can lay claim, yet feel an almost anthropological distance to. Without consciously trying to remember my past, I fear I drift further away from what little is left of my roots, so much so that the idea of a transition is falls away. I am becoming an American without a dash. As age catches me, the more I crave to be tethered. Some days I sift through previously sorted boxes, boxes I used to move from place to place within this city that does not yet feel like a home, hoping without expectation, but I know the photo is not there. I am now well familiar with the boxes. The image of Grandma Inang on the tarmac now lives a purely fictionalized existence clasped between the nerve endings of my thumb and forefinger as if I could absorb its latent power. My earliest memory of life is tied to her: she is holding my hand, and we are walking the L-shaped block from our duplex to afternoon kindergarten class. She styled her hair in a bun. Her closet stretched yards, though I recall her favoring three outfits: gray pants with either a burgundy or purple wool sweater or a loosely fitted, unripe lime-green floral dress shirt. I am still floored by how unaffected she was being a foreigner in a strange land, leaving behind what had become routine for more than sixty years and adopting anew like a duck taking to water. She spoke not a lick of English, and yet. She fell in basketball love with Gary Payton, clapped Ichiro’s at bats, flouted item limits at food banks, lost herself in unfathomably cheap thrift stores, lived alone in a two-story unit blocks away from her loved ones, was dropped off by a grandson on weekdays and accompanied arm-in-arm to the door where she handed her keys and waited for you to identify the right key for the right lock, had food with which to love her family. If she yearned for something lost, she never betrayed it. When she was not busy obsessing over whether my brothers and I had eaten yet, what was distant seemed to preoccupy her. Grandma presided over balikbayan, cardboard boxes we set atop a bathroom scale to be sent back home to loved ones overstuffed to her satisfaction with perfumes, macadamia nut chocolates, statuettes of the Virgin Mary and cheap clothes. Aging gracefully comes to mind, but the sort of grace she exuded was in her seamless adjustment into a new land and in the way she treated others, with an insistence on showing as much kindness as her body allowed, the sort of elementary kindness that can feel put-on when embodied by a young person because such qualities can feel quaint or less readily exploitable until one begins to gray. There was no guile or humility to her generosity; she was bald-facedly kind in the way Americans from the south or mid-west are reputed. Grandma Inang had every reason to feel like her life had passed her by and given her nothing, yet she insisted stubbornly on kindness. I think often about what it means to come from a family of humble beginnings, to overcome them, only to find out yet again that I am as yet immersed within it. I think about the obvious lessons and values that come from being bereft: like how materiality was love long before it was a critique. Whatever my reservations are, I still feel a connection, an intimate one, to the woman who tethers me to something beyond myself.